Leeks are Greek to me! They’re everywhere in Greece and in Greek cooking. Braised leeks are my favorite way to make them because its one of the few recipes where the leeks are allowed to stand alone and really shine. Just a few ingredients including white wine, lemon and thyme and you have tender, sweet, beautiful braised leeks on your plate in less than 20 minutes from start to finish. 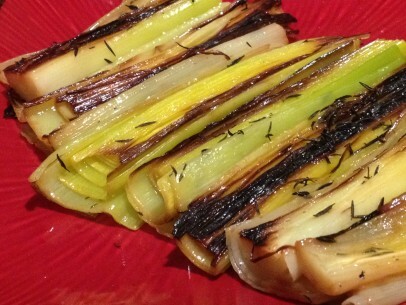 Quick, easy, lovely braised leeks! Braised leeks are perfect on or alongside pasta or rice and wonderful on their own with a wedge of lemon and piece of crusty bread. 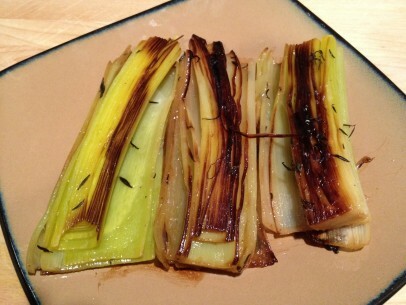 I use large leeks in this recipe, the smaller ones don’t work as well for braising. An ideal diameter is about 2-3″ at the bulb end. Cleaning any dirt or sand from your leeks is an important step. A way to make this easier – remove outer leaves and slice leek lengthwise with the root end uncut. This helps to hold together the multiple leek layers. Gently rinse the leek layers under a low stream of cold water and pat dry completely. Cut once in the center of each lengthwise pice and then cut off the bulb ends last. Two large leeks will cut up into 8 pieces that fit perfectly into a 10″ diameter frying pan or a 3 qt saucepan. 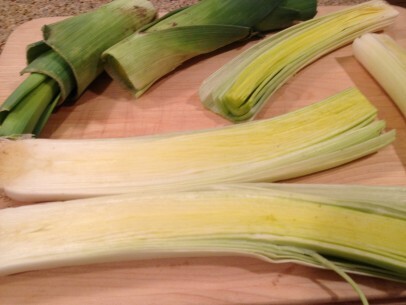 Fit them close together to help leeks keep their shape while braising. Braising the leeks will caramelize the sugars in the leeks, bringing out their natural sweetness. Cook on medium heat for only about 4-5 minutes making sure the leeks do not burn. They should be a golden to dark golden brown. Carefully turn each piece of leek over, keeping the leek layers intact. Sprinkle the turned leeks pieces with salt, pepper and thyme. Slowly add white wine to the pan in between, and not over, the leeks. Wait a minute for the wine to deglaze the pan and then add vegetable broth and lemon juice, again in between and not over the leek pieces. Cover the pan and cook on low heat for 8-10 minutes until they are fork tender. Carefully remove them from the pan making sure to loosen any caramelized pieces from the bottom of the pan before lifting out each leek piece with layers intact. Remove outer leaves and slice leek lengthwise with the root end uncut. Gently rinse the leek layers under a low stream of cold water and pat dry completely. Cut off the end, darkest green leaves at the top of the leeks. Then cut once in the center of each lengthwise piece and cut off the bulb ends last. Two large leeks will cut up into 8 pieces that fit perfectly into a 10″ diameter frying pan or a 3 qt saucepan. Add olive oil to pan and cook leeks cut side down on medium heat for only about 4-5 minutes making sure the leeks do not burn. Fit leek pieces close together to help leeks keep their shape while braising.They should be a golden to dark golden brown. 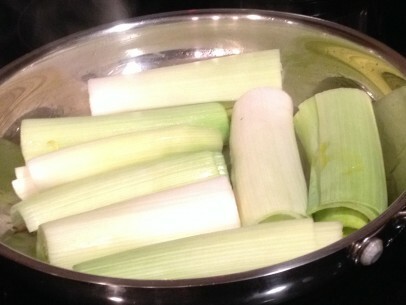 Take pan off the heat and carefully turn each piece of leek over, keeping the leek layers intact. 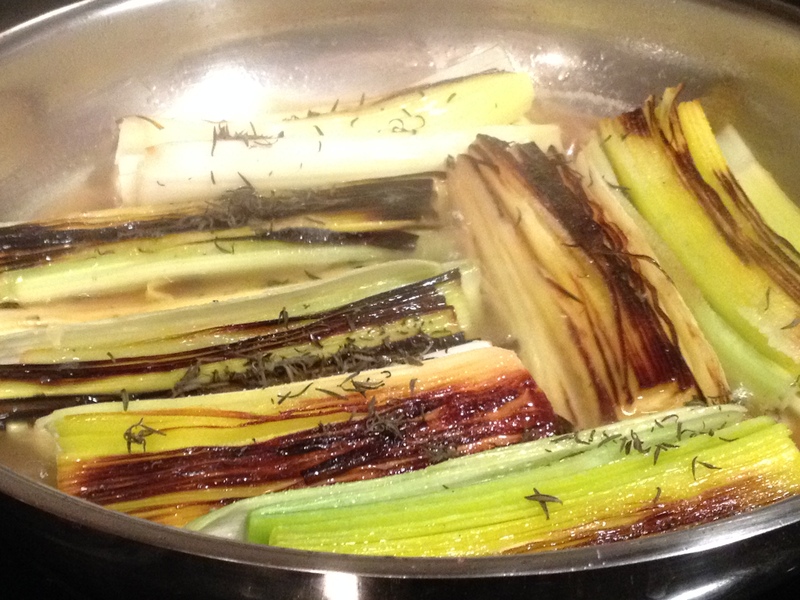 Put pan back on heat and sprinkle the turned leeks pieces with salt, pepper and thyme. Slowly add white wine to the pan in between, and not over, the leeks. Wait a minute for the wine to deglaze the pan and then add vegetable broth and lemon juice, again in between and not over the leek pieces. Cover pan and cook on low heat for 8-10 minutes until they are fork tender. Carefully remove them from the pan first making sure to loosen any caramelized pieces from the bottom of the pan before lifting out each leek piece with layers intact. Serve warm with a wedge of lemon and crusty bread or as alongside rice or pasta. My wife and I just made this tonight and though we had to change some of the ingredients due to us not having them on hand, it turned out amazingly! She had never tried leeks, I had never cooked leeks, but we now know we LOVE them! Thank you so much for this recipe and we can’t wait to share it with our family and friends.